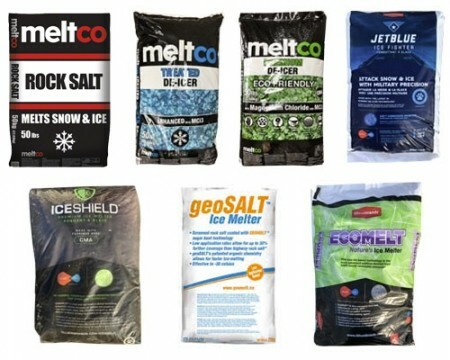 Bags of Salt and Deicers For Sale in Hamilton and Milton - Legends Landscape Supply Inc. Legends Landscape Supply offers winter products in order to make winter a little bit easier to manage. Bags of salt and de-icer are sold in manageable sizes for the average homeowner. Most homeowners simply want to keep their walkway and driveway clear or ease the burden of shoveling after a storm. For homeowners in less snow-prone areas, you can give your family and friends sure footing with regular use of these products. Think all salt is created equal? Find out what exactly makes SmartMelt Technology in Jet Blue Ice Fighter products far superior to generic ice melters in our video. Our products can save you up to half the money you usually pay for small bags at large department stores. We have the knowledge to tell you how much of each product to use, which helps save our water and fisheries. Sodium Chloride: Rock salt-the most common product available. Works well around 0C to -10C. Potassium Chloride: The most expensive of the chlorides. Often mixed with rock salt. Our newest product, Ice Axe - NB, is like steroids for rock salt. It's designed to penetrate and stick to rock salt to increase melting capacity to -29C. And it's completely biodegradable. Many homeowners lose as much as 15% of the treatment they apply to a location due to casting or bouncing away from the surface. This can affect the vegetation surrounding the walkway or driveway as well as your winter budget. Drop the product from a lower height to reduce bouncing. Good deicers can help save the environment, and cost less when you learn the proper amounts to use. We offer products by the bag, skid, or truckload. Stop by our showroom to discuss your options with one of our experienced staff members.